Have you ever printed a graphic that looked "Christmas" red and green on screen but when you printed it, you ended up with purple and lime-yellow? The way images look on screen differs from the way they look in print, even though they aren't always so dramatic. Calibrating your monitor provides a screen display that simulates what prints on paper. Calibrating your printer ensures that what you print is consistent with what you see on screen. The two go hand in hand. Monitors use additive RGB color, while printing uses subtractive CMYK pigments. Each method is a different way of reproducing color. The human eye can distinguish more colors than inks can print. In print, ink layering and overlapping cause subtle shifts in color not found in the individual pixels that make up a screen image. On screen, a red circle may overlap a yellow circle cleanly. In print, you may see orange where the overlap occurs. Printed images don't have the same range, saturation, and contrast as a monitor, which makes the colors typically darker and less vibrant than on screen. Paper texture and brightness also affect—and change—a printed image. The first step in printer calibration is to calibrate your monitor. Then, make sure you use the correct printer driver for your printer. 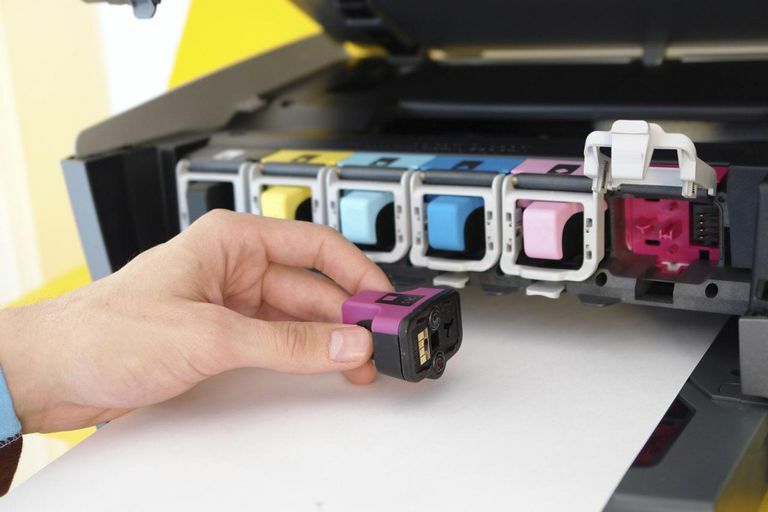 Within the printer driver are controls for fine-tuning the overall appearance of color from your printer. Depending on your needs, this may be sufficient to get the color you want. If you want to move beyond the basics of color calibration, you have two general methods to select from: visual and mechanical. The more expensive and accurate option is to use a hardware device that can read the output from your printer and make adjustments as necessary. For most users, visual calibration or the use of generic color profiles for your hardware is adequate. Using test images with a wide range of tonal values that ideally consist of a number of color bars, photographs, and blocks of colors, you can visually match the screen and print colors. You display and print a test image and then compare and adjust grayscale and color output in the controls provided for your printer. You can obtain digital test images from the web and from some software or hardware manufacturers. Whether you are calibrating visually or with color management software, target images provide a range of color and grayscale targets for calibrating monitors, printers, scanners, and digital cameras. You can find free and commercial targets and other test images. ICC profiles provide a way to ensure consistent color across all your devices. Color and print professionals use files that are specific to each device on the system and contain information about how that device produces color. They create separate profiles based on various combinations of ink and paper—factors that affect the appearance of the printed material. The stock or default profiles for your printer model that come with your software, from your printer manufacturer, or from other websites, are often adequate for most nonprofessional printing situations. For precise color management needs, you can use color management software to develop custom ICC profiles for any device. Additionally, some online sources can create custom profiles for you. One such vendor is Chromix. ICC profiles are available for printers, monitors, scanners, digital cameras, and other equipment. Color professionals use Color Management Systems, which include tools for calibrating monitors, scanners, printers, and digital cameras so they all "speak the same color." These tools often include a variety of generic profiles as well as the means to customize profiles for any of your devices. Choose the calibration tools that match your pocketbook and your needs for accurate representation of color on screen and in print. Don't stop with your printer. Calibrate all your color devices: monitor, scanner, and digital camera.